Chugging Vodka Through a Trumpet? WARNING: What you are about to watch is not only dangerous, but actually absolutely disgusting when you think about it. 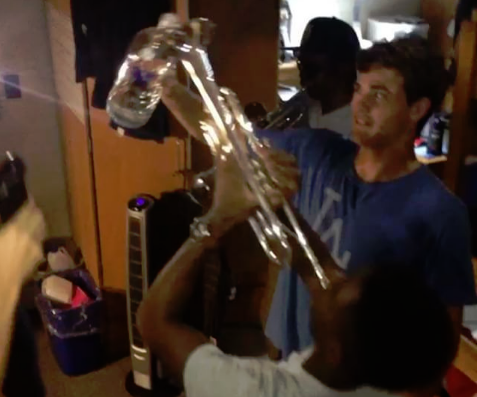 A video of college students chugging vodka through a trumpet is gaining massive attention today. We know that multiple members in the video are students at Cornell, however at this time we don't believe that they are members of the marching band, some of them actually are athletes at the Ivy League school. Unfortunately many of the comments on the video are pointed directly at members of the band community. Beyond the obvious of this being dangerous due to a large consumption of vodka, if that horn hasn't been cleaned out recently then the back wash going into that person's mouth would be absolutely disgusting. We are all smart enough to know that only a tiny bit of vodka probably made it all the way through the horn to his mouth, but what did would be caked in what we like to call the "green sludge". You know what we're talking about. To all of our fellow band members, we know that your friends are going to watch this and say, "hey, lets do this at the next party!" End it there. No one needs to consume that much vodka at one time, nor use an instrument as a funnel. Be smart. Let's not have any copycats. No one is going to tell you to not drink in college, just be responsible. And for god's sake don't damage your instrument while being an idiot AND TAKE VIDEO OF IT!